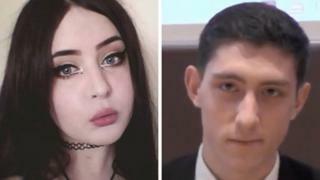 A terror suspect who entered a "Miss Hitler" contest took part in a web chat which discussed "lesser races" mixing with Aryans, a court has heard. Alice Cutter, 22, allegedly wrote "I'm going to be sick" in response to a post in the online chat group. Birmingham Crown Court heard she also messaged her partner Mark Jones, 24, urging him to "wipe" evidence as a ban on National Action (NA) was announced. The court heard several posts allegedly written by Ms Cutter followed a comment on "lesser races" and a post referencing an article on mixed-race children. One of the comments read: "I'm going to be sick. Everything hurts and now my brain hurts too." Meanwhile, text messages allegedly sent by Ms Cutter to her partner read: "I suggest you get your arse home asap and make sure everything is wiped. "It's definitely happening. Well it's already happened." In further posts on the secure Telegram messaging app, a user alleged to be Ms Cutter described foreigners as "beasts" and said "pathetic" whites made her skin crawl, jurors were told. The court has heard there was no dispute that Ms Cutter had entered a beauty contest in 2016 under the name "Buchenwald Princess" - a reference to a Nazi-era death camp.